Template collection with various risk matrix designs for presentations and PowerPoint documents. 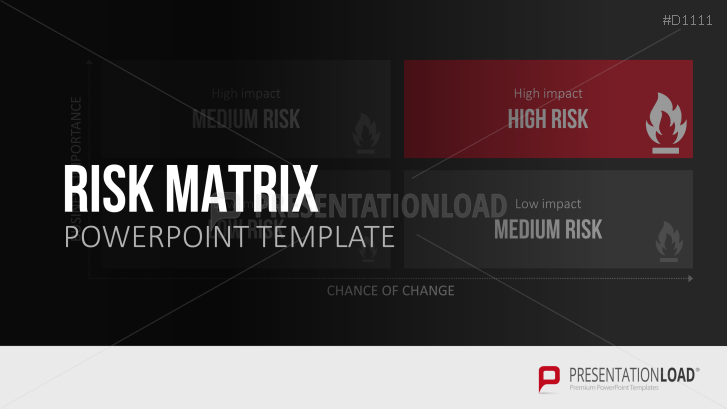 With the Risk Matrix charts for PowerPoint, you can provide the probability and damage impact of certain risks for your company with the help of matrices in different layouts and with evaluation fields with dimensions from 2x2 to 5x5. Risk charts visualize the probability of occurrence and the potential or already current damage caused by risks. This information is presented on the X and Y axis. The evaluation is carried out in different stages which are shown in boxes that form a grid in the chart area. These charts help companies communicate to employees the risks of projects, processes and investments and how to take appropriate risk management measures. The matrices, for example, can display damage caused by staff and delivery failures or assess the risk-taking aspects of cooperation partners. With this collection, you have a wide range of risk matrix chart templates with 2x2, 3x3, 3x4 and 5x5 assessment fields. The matrices also include creative variations, such as 3D cube or scatter plot. Additional information or explanations can be added in slides combining a risk matrix and text placeholder.